Book hotel rooms online with us at Luna Falesia Mar Hotel at the lowest rate, guaranteed. Get a holiday discount room rate at the 3 Star Luna Falesia Mar Apartments located at Falesia east of Albufeira in the Algarve. The complex has 240 holiday self-catering studio and one-bedroom apartments providing accommodation from two adults to four adults. The Luna Falesia Mar apartments are set in a landscaped garden only 150 metres from the sandy Falesia beach and enjoy great views of the ocean. The various apartments are air-conditioned and are equipped with balconies some with sea views, self-catering kitchenettes, satellite TV, direct dial phones, terraces and a safe. 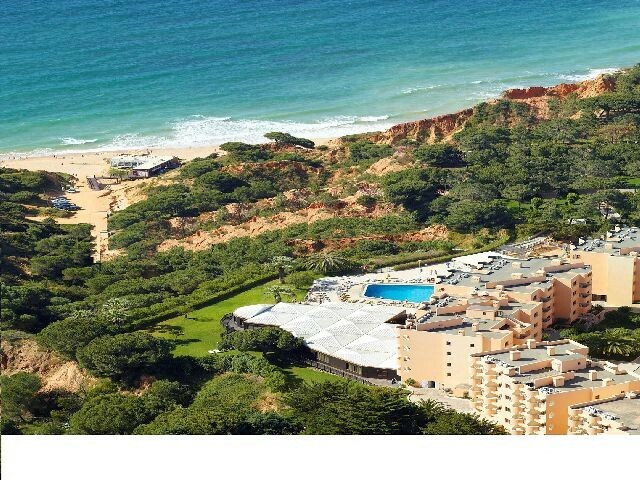 Luna Falesia Mar Apartments in the Algarve facilities include a restaurant, a snack-bar, a bar, two adult pools and a paddling pool for children, a Kids Playground, free Wi-Fi access in public areas and free shuttle service to Albufeira which is about 5 kilometres from the Resort.